The content of this webpage and parts of it is subject to copyrights ofK-Bonds AG or a person granted a right of use by K-Bonds AG. Single pages of this website might be downloaded, temporarily saved or printed for the sole purpose of usage in your company. Any other reproduction, transmission or dissemination of the material in these Web pages by downloading, saving, printing or by any other means is prohibited without the express consent of K-Bonds AG. Please address any inquiries in this regard to info@k-bonds.de. Every effort has been made to ensure the accuracy of all information and links provided on this Website. However, owing to the inherent nature of the Internet and the risks of interruption or termination of the transfer of information, any and all liability which might arise from the use of, or reliance on, the information or links contained on the website is excluded. Any information on this site is for information purposes only; in particular it does not constitute legal advice or an offer to acquire or sale or the investment in finance investment instruments of any kind. Much information is regularly updated, so please compare the date of any printed edition with those included on the website to make sure that you have the latest version. The legal information on this page as well as all questions and contentions in connection with this website are subject to the law of the Federal Republic of Germany. 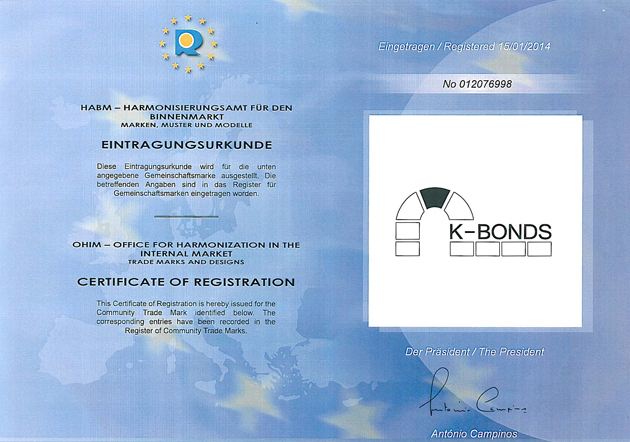 The word/figurative mark K-Bonds was registered with the the Office for Harmonization in the Internal Market (OHIM) in Alicante under no 012 076 99.